The Ubiquiti NBE-5AC-GEN2 is the latest in compact high powered point to point wireless bridging technology. The NanoBeam features a more precise beam pattern than the NanoStation to ensure an reliable connection even in high noise environments. The NBE-5AC-GEN2 uses proprietary ac technology to deliver fast data rates up to 450Mbps and the built-in high gain antenna can deliver stable connections up to 15km. The NanoBeam wireless bridges feature a simple and intuitive 2 piece bracket that allows it to be mounted directly onto a pole and adjusted effortlessly. The Nanobeam can also be mounted on a wall using the optional NBE-WMK wall mount kit. 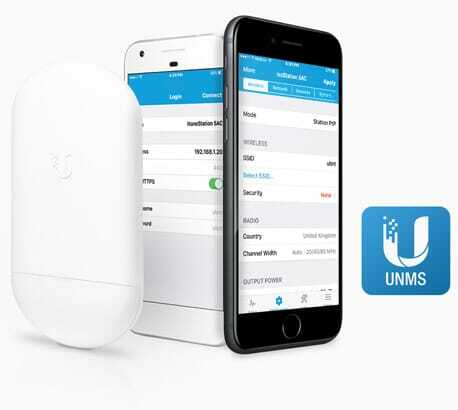 The NanoBeam 5AC also features a separate built-in management WiFi system that allows you to connect directly for easy app based setup making deployment quicker and easier than ever. The NBE-5AC-GEN2 supports PoE pass through on the second port which enables a second NanoBeam to be connected without requiring a separate power supply. This is ideal for chaining multiple devices without complicated power and cabling setups. Why buy the Ubiquiti airMAX NBE-5AC-GEN2 NanoBeam 5GHz Wireless Bridge from Connectec?